Offering over 3500 items of plant, H.E. 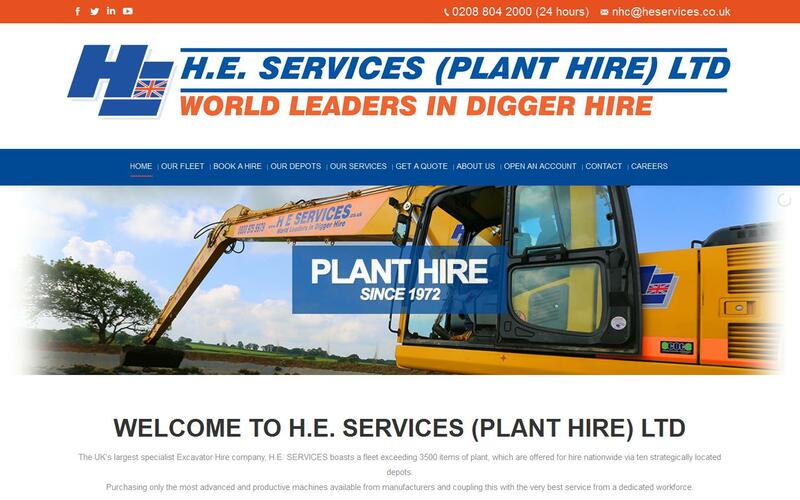 Services are the UK’s leading supplier of excavator machinery hire options. Based in Rochester, our company has 10 nationwide depots that are strategically located, offering the most advanced and productive machinery that cannot be found anywhere else. For many years, our company has worked with leading manufacturers such as JCB, Komatsu, Hydrema, Terex, Amman, Manitou and Thwaites, who have helped to build our company into what it is today. Here at HE Services, our machines are all within 3 years of age and are fully-functioning additions to any industrial environment. We combine our extensive knowledge with the latest models and technology to provide our clients with excellent quality plant machinery that are delivered promptly and efficiently. Our dedicated workforce take great pride in their ability to provide a unique and professional service unlike any other. Our team of specialists work hard to ensure that each and every customer receives excellent service as well as fully-operational machinery with little to no maintenance. Here at HE Services, we can guarantee that all machines will arrive on-site along with their full documentation, which includes important information such as maintenance, service and test certification. Our 24-hour service has been highly praised by our customers over the years, who we continue to impress by developing our ideas and innovations to meet the standards set out by the industry. We offer rapid response, few breakdowns and 58 pre-hire inspection checks to ensure that our clients are getting exactly what they require.